Preserve the Dallington Forest POW Tree! 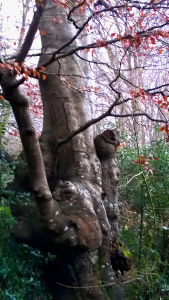 Just inside Dallington Forest, and close to a public bridleway, there is a culturally-important tree that is not well known in the area – perhaps because it is difficult to find without guidance. We have Tree Warden-led walks into the Forest that take in this tree – so come along on the next walk! As part of the Dallington Forest Project I’m attempting to gather all relevant information together to document it for the benefit of current and future generations before it is lost to the ravages of time and decay. Known locally as the ‘PoW Tree’ this is a veteran pollarded Beech tree, probably around 250 years old, that is rapidly approaching an untimely end. Much of the interior of the trunk’s base has been hollowed-out by fungi, and the opinion of an experienced arborist is that the trunk will fail catastrophically within the next few years. There was a German Prisoner of War Working Camp GPWW 145 situated at Normanhurst Court, Battle, less than 10 miles away, continuing to hold prisoners until 1948. I understand that the Normanhurst PoW camp supplied labour to the Gypsum Mines at Mountfield and, at the time, much of Dallington Forest was under the management of the Mine. It is not inconceivable that parties of PoWs would have been employed as foresters and, perhaps during a lunch break, one of them climbed the tree to leave his indelible mark for posterity. Who was ‘TB’? Or was the graffiti artist’s name actually ‘T.B.KÖLN’? Perhaps records could solve the riddle of his identity. Sadly, I understand that most of the records of the PoW camps’ occupants were destroyed after the war. Was this related to the slow repatriation of Axis forces to German and elsewhere compared to the relatively speedy repatriation of PoWs back to the UK? Is there a darker political secret waiting to be unearthed? It would be interesting to find out. Before this tree falls and is lost – it could be in a gale this autumn – we have a limited opportunity to document and record this culturally-important tree for posterity. For example; wouldn’t it be wonderful to have a bark rubbing done of the inscription that could be framed and displayed together with information about the tree and the inscriber in the Brightling and Dallington Village Halls? And we need urgently a good photographic record to show not just the details of the inscription but the tree in its surroundings and context. Help from amateur (or professional) archivist and historians would be very welcome to research such records as exist of the Normanhurst Court PoW camp, its occupants and the Gypsum Mine and its management so that we can add more of the human dimension to the history of this tree. There is some more information about the Normanhurst camp on the Sussex History forum at http://sussexhistoryforum.co.uk/index.php?topic=1573.0. This gives some useful background to why the prisoners were there in 1946, and the programme of re-education planned to ‘de-Nazify’ prisoners’ attitudes before they were returned to Germany. Sadly no one on the forum has been able to identify TB and it appears that any records of German POWs would be held in Germany – and so far I haven’t found anything online, but my German is very rudimentary so someone else may have more success.